I feel so good when I’m wearing this dress. There is a lot of fabric in the top half of the dress (how about those sleeves?) but I think the volume is nicely balanced by the shortness of the dress. Well, that’s my story and I’m sticking to it! I love sneaky little details on the insides of my makes. Do you? Any excuse to use some chambray and liberty… right? Lizzy recently commented that I should change my blog name to Liberty Anna. She definitely has a point! Did you spot my labels? My stylist designed and gave me 100 ‘Anna à la mode’ (translation: Anna in the style) labels for my birthday. A very thoughtful gift from a non-sewing friend. The French language nicely leads to my next point… French linen! 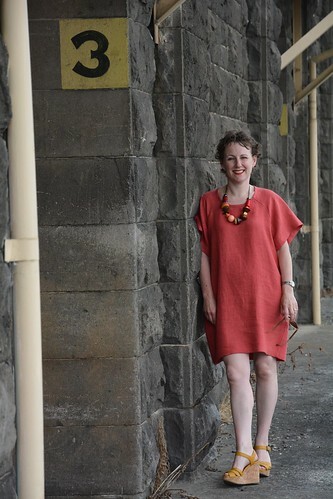 The glorious linen used for this dress was one of my precious purchases made on a Stitching Up Paris tour. I read Liz’s blog post about her fabric/yarn shopping in Paris only weeks before we left for our overseas adventure. Liz talked about Barbara’s personalised sewing, knitting and/or crafting tours. Oh yes please! I emailed Barbara and we made a time for my very own shopping adventure. It was a fabulous afternoon of patting fabric, buying a couple of gems (like this linen) and bumping into Rachel and Julie. It’s a small online blogging world! Barbara was an excellent guide. I recommend her tours without hesitation. Now I just need to get back to Paris so I can do another. 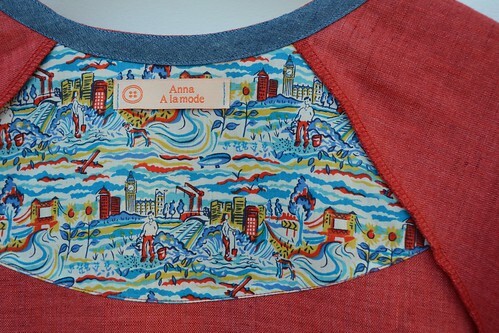 Meanwhile, I have a little red dress with a big personality to remind me of my Paris fabric shopping adventure. In my eyes, that’s the best kind of souvenir you can have. The dress is drafted to be knee length (the pattern comes with five different lengths), but I prefer my dresses to be above the knee. I cut the dress as per the pattern and turned it over 5/8″, and then for a super deep hem, another 6″. This is my first, but definitely not my last, super deep hem. I think they might be a little addictive! So elegant and I really like seeing all the special little extras you include. Thanks Robyn. I’m usually a little too shy to share the inner workings of my makes, but these insides were both pretty and neat, so it was an easy decision. I think this looks fantastic and it really suits you too.. It has a very elegant casualness too it and the new labels are perfect for it! Elegant casualness… I like that! Thanks. I’m glad you posted this! I have this pattern in my stash to sew up, but wanted to see how others were doing it as the styling on Pattern Fantastique is a little wild. Yours looks lovely, and the sleeves drape nicely. Now to find the right fabric (knit or woven) and make myself up one! Thanks Meg. It’s always a gamble sewing up a newish pattern. 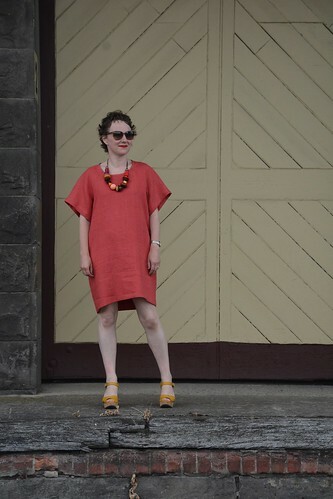 I’ve also made a knit Aeolian dress… I’ll share that in the next few days. 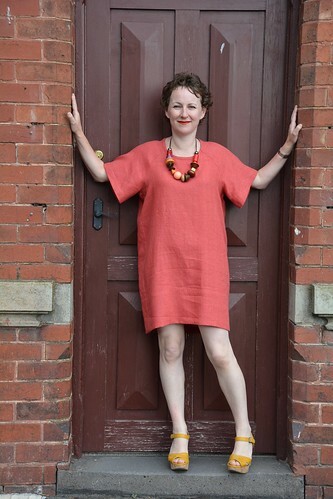 I used some of my European knit stash, predominately cotton with a little stretch, and the dress still hangs nicely without being made from a super drapey fabric. I don’t think I’m done with this pattern yet! This dress looks so cool and comfortable, and I do love the look of the deep deep hem. I’ll check this pattern out as I love knits…and like you said it’s made for knits too. 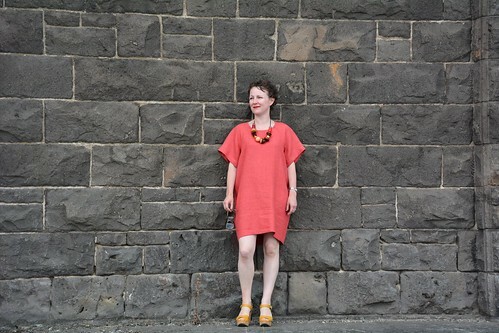 I’ve made a knit dress too. I’ll be sharing that very soon. This is a great design on you – loving the deep hem. The inside details are lovely. I got a lot of satisfaction from sewing this dress. Here’s hoping I get loads and loads of wear out of it too. This is beautiful! I love your inside shot, too. I hadn’t heard of this pattern before, but I’m liking it! It’s a relatively new pattern company Joanne and I only know of one other person who’s sewn this pattern. 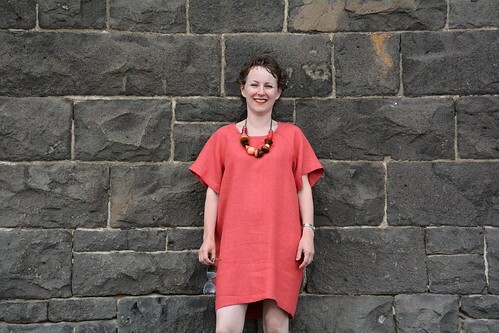 Lara made a boxy tee in jersey – http://thornberry.wordpress.com/2014/12/18/aeolian-tee/. I’ve already used this pattern three times and I don’t feel done with it yet! This looks awesome. I love it and that linen looks amazing! The linen is amazing Bree. Chic & comfy, great colour and the fabric looks a dream. Love the inside detail and your shoes, I love yellow shoes. I have a bit of a thing for mustard at the moment. I’m trying very hard to talk myself out of buying some mustard linen for a summer dress. Buy it buy it, it will look so good on you plus it will match all your other lovely colours! You look stunning in this! I took my white one on a road trip. Yes white linen in the car for hours on end madness. It survived. I just couldn’t take it off. Thanks for posting! I even got dark chocolate on it. I am wearing it right now! Yes I need heaps more. 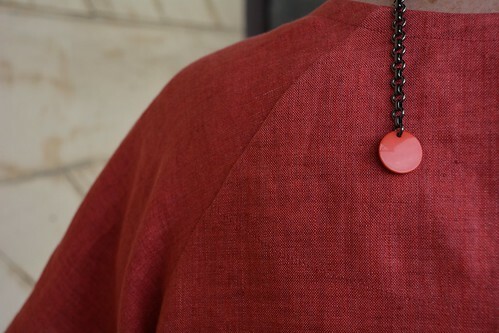 I have to make another to document the pattern hack so I’ll be on the look out for some thing special. I have been contemplating making a winter weight one. Yes the Aeolian has been moving along since Thornberry and yourself have been posting your Aeolian triumphs. What a cool dress! I really love the shape of it. It looks awesome on you. Thanks Kat. I’m really happy with this dress. There will be more of Aeolian’s in my future. Stunning dress and especially so that lovely deep hem! My Aeolian love affair has officially begun!